This is a follow-up to our May 2010 newletter - I must say though that Twitter hasn't produced any noticeable results for our "test" online gift store, but this doesn't mean it won't work for your business. Developing a large following is something many new Twitter users struggle with. Although we can understand how movie stars can have 1,000’s of followers, how can a business do the same? If you’re keen to increase your following, we have some helpful hints on how to do this and still stay within the Twitter guidelines to avoid account suspension, as there are certain practices that are not allowed. Do you want a small group of followers where you can easily keep track of the timeline and interact with everybody or do you want to grow as big as possible and utilise Twitter lists to keep up with the tweets you care about? If you have a Twitter account for personal use, “quality” will probably work best for you. If your objective is to promote your brand or business to the world market, your goal will be to reach as many potential clients as possible, so “quantity” will be your goal. 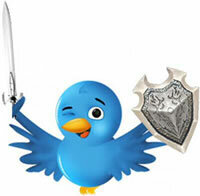 Growing your Twitter following is an easy and low cost method to promote your business or brand worldwide. These are a few tools that you may find useful. There are many more available, but these are a good starting point. Simply enter your user name and it will show you who isn't following back, who is a fan and mutual followings. If you connect with Twitter, it will also give you the option to follow or unfollow users. Similar to FriendorFollow but more advanced and it can filter your account for a variety of stats such as users without a profile image or users that are quiet or tweet a lot. There is a pro upgrade available but the basic mode has all the features an average user will need. When your account starts to grow rapidly it becomes hard to keep track of all your new followers. If you want to set up a welcome message for all your new followers, this is the tool to use. You can set up an auto DM (Direct Message) and welcome new followers. DON’T add a link to that message because that's what everybody is doing and will only annoy your followers. Come up with something creative and original within the 140 character limit. There are also features that will allow you to auto tweet status updates but that is not advisable as you should keep it personal on Twitter, see the comment below. Be careful, this tool is fun and addictive! You can actually use this to grow your stats on Twitter, Facebook, Website and YouTube. You can earn credits for connecting with other Twiends users and use those credits to let others connect with you. Sort of like a marketplace. You can even tweak your setting to get higher quality followers and there is an option to buy credits if you don't have the time to earn credits manually. If you want to find followers in a specific geographical area or category, this is the tool for you. It lets you search for users by city or from a directory of categories. This is great if you have a local business and you want to connect with all the Twitter users in your area. You can also follow and unfollow within this tool. Now How Do I Get Followers? All the above will help you to manage the new followers as your account starts to grow. Obtaining new followers can done in many ways. Just Google: "follow back list twitter"
As you increase your followers the tools suggested below can help you manage your Twitter account. You can also unfollow people that didn't return the follow if you wish but DO NOT mass unfollow people or unfollow those who did return the follow. These are bad practices that could get your account suspended. As a new, small business on Twitter you are not a celebrity that has 1000’s of followers and only follows 10 users back. Your account should have a healthy follower ratio. You can also only follow 10% more than your follower count when you pass the 2000 follower mark. Example: 2500 followers will allow you to follow 2750 users. * Don't spam your product link over and over again. * Don't use auto tweet tools except for a meaningful auto DM perhaps. * Don't mass follow and unfollow since this could get your account suspended. * Don't unfollow those who return the follow just to make yourself look more popular. If you stick to these guidelines and use the above tools you can steadily and simply grow your following to any size you want. Site of the Month is Oraka Deer Park - and they receive a free direct click through and feature image from www.matamata-info.co.nz to their website.